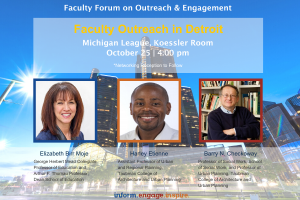 On Wednesday, October 25, CEO launches its Faculty Forum on Outreach and Engagement. The theme for the series is Educational Outreach to Inform, Engage & Inspire: Fulfilling U-M’s social contract with the public. Our panelists who will start the conversation about this important topic are Dean Elizabeth Moje from the School of Education; Barry Checkoway from the School of Social Work, and Harley Etienne from Taubman College of Architecture and Urban Planning. These faculty members have made career commitments to educational outreach and will be sharing their work and perspective about U-M’s engagement in Detroit. Come join the conversation and participate in the networking reception immediately following.